This is on the YSL-353 I just obtained. When moving the slide in to position 1 quickly, the outer slide lower tube end guillotines/pinches my left hand at the base of the small finger. This happens where the pouter slide travels into the recess near the end, where I hold the trombone with my left hand. It is sharp and has no issues with drawing blood and pinching rather badly. I have now filed that edge smoother but it can still happen due to its construction. This does not happen at all on my Bach TB600. Most trombones have a small ring soldered to the end of the outer tube so there is no sharp edge there. It might have been removed (or not replaced with a tube replacement) on yours. I used to have that problem with my Getzen Deluxe (not to be confused with the Super Deluxe or the Dude). My horn had no cork barrels to speak of and the end of the outer slide used to pinch when it came into first position. It soured me on Getzen trombones to this day. One solution is to add a curved guard off the end of the cork barrel (the Super Deluxe had one of these) to keep your hand away from that sharp slide. Or chage your grip so that you have less hand on the cork barrel part of the grip. I also had the problem until I change my grip. I still have problem on small tenor with narrow slide, though. Playing a Conn 6H and getting blood blisters when your hand is caught on the slide's return trip to first position is a time-honored badge of courage! Snake bite! Yes, I 've done this to my self many times. Interesting how you say your horn did this to you. Keep your hand away from the slide. If you've got big hands just make sure you're not lazy about your hand position. You can also use a grip like a Getagrip, or a Neotech. Also, some horns have longer cork barrels than others. Its painful, but if you're careful you can avoid it. I had my last "snake bite" about a month ago. And my first about 40 years ago. Trombone is only a couple pounds, it does not need a death grip. Try just curling a couple of your left fingers under the tube without seizing it, just let the tube sit on the pads of the curled fingers. This is a very relaxed grip and it works. Sitting here with 2 blood blisters on my hand, I question the design. My Bach does not do this. It seems to be just a better design than Yamaha in that area. I need to investigate tonight what they have done different. Their slide lock also seems better. I have damaged my little finger with my Bach 16 a couple of times. But only because I was in the process of oiling the slide and not concentrating. I don't recall it ever happening when I was playing. My greatest problem is a pain in the bottom joint of my thumb due to osteoporosis. Osteo Relief Paracetamol is the only thing that eases the pain. 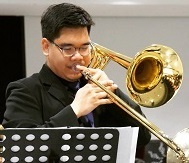 Also the pain of Cervical Spondylosis, which can also be a problem when playing a trombone. Only a problem for us older guys, I guess. 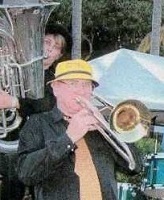 There's nothing wrong with the trombone, you're just holding it wrongly. Maybe a picture of your left hand grip would help with suggestions. A superior design. No issues. That's one of the biggest reasons I handed the Courtois trombone back to the reps at ATW after only a few notes. Terrible ergonomics and my hand wouldn't even fit on the inner grip. I would have had a hand that looked like that! The rep didn't believe me even though I had an Edwards in hand for comparison. Even my alto had a larger grip area. Also, in thos pictures you are definitely holding it in a way that is not conducive to avoiding that injury, on either horn. If you must hold it that way, beef it up with a leather grip which will increase the grip diameter by a few millimeters. That should fix it. This is the lowest stress grip I have found. The only effort in it is counteracting bell twist with the index finger. (And an outrigger counterweight could solve that.) Note the palm is completely elevated off the tube. The Yamaha 352, 353, 354, etc, horns are based off of the 6H which features the same short barrels, so it makes sense that you'd knick yourself on this Yamaha, especially because it's probably an older model. The newer 354s have a rounded end so they don't have this problem. I did it several times to myself on my 6H when I first got it and just adjusted my grip accordingly. Unfortunately it's something you're just going to have to deal with if you want to play the horn. Some people have modified their horns with an extra piece of metal on the end of the barrel so this isn't an issue. 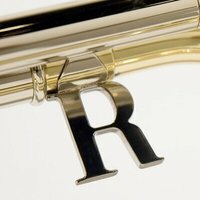 I think every trombone player has been bitten by the slide at some point. You figure out pretty quickly how to adjust your grip to not get bit. My Yamaha YBL-830 bass (and I believe every current Yamaha design) has a rounded end like Bach, and I still got bitten. The design sure helps, but it is the grip that is the most important factor. If you grip low, especially with large hand, you are at risk. In my opinion, it is the increased diameter of the ring at the end that does it. It keeps the hand skin away from the sliding tube. As others have pointed out... Yes you're right the ergos on your horn aren't for everyone but you can adjust your grip so that this isn't an issue. I like the link that FeelmyRath posted and I use a grip similar to that one. You shouldn't be using the same grip on every horn. I hold my bass differently than I do my large tenor or small tenor. They all balance in different spots. Side story... One of my friends was complaining that the ergos on a Yamaha bass trombone were bad and he needed a thumb rest. I asked to see how he was holding the horn. He was holding it similar to how you would hold a small horn! He was trying to use the trigger as a thumb rest and all the weight was sitting on his middle finger. Of course he was having problems. Showed him how to hold correctly and all the issues went away. Try messing around with how you hold the horn. If that's a big enough issue and you don't want to adjust... that's fine to. Sell the horn and buy a horn with ergos that fit you! I used to have that problem all the time and I adjusted my grip for it. It's pretty common. Actually, holding it in a better way helped my playing in holding the horn steady too. My ysl 354 hasn't done that over two years. Though I experienced it with another nameless much older trombone right after oiling it.